How do you turn feelings into music, and then transform that music, and all the feelings it captures, into visuals? As a form, the music video has come a long way from its origins as a simple live performance video. Creatives in the field continue to bring the genre into being, drawing from film, as well as performing and visual arts. Several distinct types of music videos have emerged, performance, narrative, and concept MVs being the main categories. More often than not, K-pop MVs are a blend of the three. It’s not so often, however, that this blend is to a creative rather than disjointed effect. On the first watch, Key‘s “One of These Nights” appears conventional on all counts, thematic and stylistic. 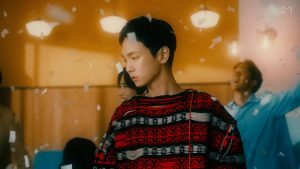 Centred around the theme of longing for an ex-lover, the MV predictably features flashbacks of the relationship and scenes of Key struggling with his lingering feelings, intercut with choreography shots. But it doesn’t take long to notice that despite these familiar elements, there is something strange and outstandingly artful about the way that the MV was made. Flashes and glows of light, and recurring visual motifs of confetti and rain, bind each set and sequence together. Time and space collapse, forming a mental landscape of longing and distress. From the very start, there is a sense that something is off-kilter. The sun rises in the opening shot, except the sky is bathed in the fiery hues of twilight; it’s a sunset in reverse. 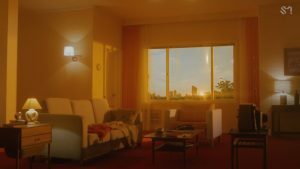 Key sleeps fitfully on a sofa; the golden glow from the windows suggests it’s evening, yet it doesn’t reach the sofa, which is cast in the darkness of night. Waves of artificial light, whose source is unknown, sweep through the room. 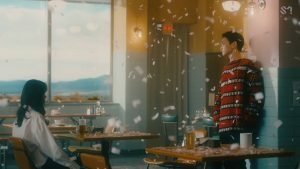 The bizarreness of it all cues the viewer in on the fact that what’s being presented is not a physical space, or real events, but Key’s inner world as he struggles with memories of his ex-lover. Light has a constant, unsettling presence in the MV. It pulses like lights from a party long past, and sweeps across scenes of the raging sea like the revolving beacon of a lighthouse. It flashes like lightning through the living room and cafe windows, and casts haunting reflections of Key’s lover on the subway windows. 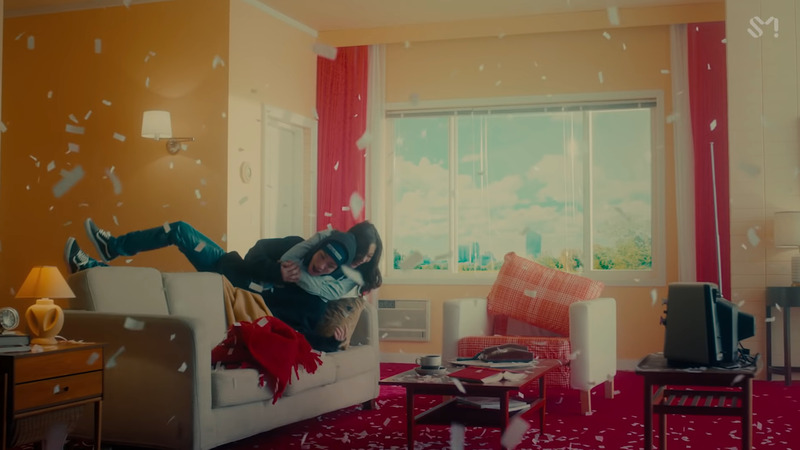 Key’s emotional turmoil is not conveyed through dramatic gestures—it’s externalised in subdued but apparent ways: the strange omnipresent light, the Dutch tilts, the rain that pelts down on him indoors. The song, like the MV, is restrained in how it is executed. The production is smooth, the house beats trendy, but the subtle touches are what pack emotional punch. The light strums of the guitar create a dreamy, otherworldly effect. The consistent, gentle clicking of a mechanical metronome provides a calm backdrop, emphasising the yearning that seeps through Key’s airy falsettos. The MV is, likewise, a series of carefully chosen contrasts. There is constant movement—from the camera, Key’s dancing, the subway moving—but when faced with his ex-lover, Key is always locked in stillness, staring blankly, unable to move on. Confetti showers down on his memories, to an ironic effect — the mood is anything but celebratory. The use of lighting and visual contrasts creates a surreal mood that emphasises the chaotic inner state that Key is experiencing. His emotional turmoil is further brought out by the way that linear time ruptures. Time is turning back, as suggested by the setting sun moving in reverse and the clock hand moving anti-clockwise. Yet Key’s memories are always incomplete. A flashback of his ex-girlfriend wrestling him dissolves into a shot of the same room, empty and bathed in a sunset glow; he sits with her at a party where everyone is having a fun time, but they don’t appear to notice each other. Even in reverse, time cannot move normally. The present of their separation constantly encroaches onto his memories, which can never fully replay without being disrupted. “One of Those Nights” is perhaps an unlikely debut for all the expectations Key as an artist, and as part of Shinee, may have built up over the past decade. Yet there’s an elegance to the controlled chaos within the MV, and a maturity to how measured its artistry and emotions are, that fits him like a glove. The subdued delivery paints the perfect backdrop for emotional intensity, and it’s in its understated quality that this release proves truly enduring.